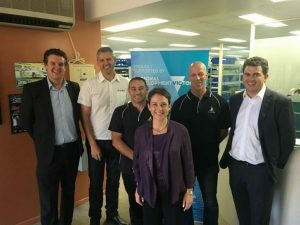 Strategic Thinking to bring a focus and clarity on how to gain investment for growth from the Victorian Government’s Future Industries Manufacturing Program. Albins Offroad Gear is a family owned business which has been highly successful in designing and manufacturing high performance transmissions. The company has clients in the offroad vehicle market in Australia and around the world who participate in the Dakar Rally, Baja 1000, Australian V8 Supercars, European and Australasian Rally Championships. In 2016, the company took part in the Roaring Success “Strategic Planning for Defense SMEs” program. As a consequence of that we were invited to help them to implement their strategic planning. Guide the extended leadership team through strategic planning sessions at offices in Ballarat. The thinking that the directors did during the “Strategic Planning for Defense SMEs” program has now been fully shared with the operating management of the company. The team have understood the key focus areas to be worked on and is actively work those action plans. The MD has used the output from the planning work as a base to prepare for and win new investment for the company from the Future Industries Manufacturing Program. The funds have been used to expand it’s warehousing and administration capacity, as well as upgrade its materials handling and other equipment. The company has consolidated it’s place as a high performance specialist. In 2018, Albins was awarded the “CEO award for an Outstanding SME” by Thales at their Annual Partners and Suppliers Awards. “We started our journey with Roaring Success in strategic planning workshop. I found such great value in that program that we engaged Steve and his team to further assist us with our advanced strategic and action planning with our entire leadership group. The concepts and thinking that we were exposed to during these programs has changed our organisations thinking dramatically and we continue to use the tools and concepts with great success.